Haworthias grow best a well-drained yet moisture retentive growing medium. The choice of a growing medium should be based largely on the local climate, and in turn, determine the watering regime. The structure and the components generally determine the properties of a growing medium. When water in a growing medium moves downwards under gravity, a portion of it is held in the pores of the growing medium by capillary action. A given volume of growing medium with smaller particles has a bigger surface area than those with larger particles, and therefore holds more water. The optimum drainage is achieved through pure non-absorbent particles of ~4 mm size. Any larger particles increase very little to drainage and become mere obstructions to root growth. When the particle size of a growing medium is under ~2.5 mm, water will form a perched water table (PWT) at the container bottom or above any coarse drainage layers, where capillary action overcomes gravity. Perch water can only evaporate but will not drain. The smaller the particles size, the greater the PWT height. This saturated water occupies air spaces and often causes root rot. With the same growing medium, PWT heights are the same in all containers. Adding a coarse drainage layer (for example, gravels) at the container bottom does not improve drainage, but moves PWT higher and closer to roots. The uniformity of particles is also important. Mixing large particles with small is often ineffective to drainage because the smaller particles fit between the large, increasing surface area and consequently capillary action. A growing medium with particles in 2.5~4 mm size range provides the ideal balance between drainage and moisture retention. Sieves can be used for removing the particles out of this range. On the other hand, finer grained particles that are sifted through are superior rooting mediums. Since Haworthias are perennial plants, the components of a growing medium should be physically stable and not decompose within a few years. This excludes most organic materials like peat and coconut coir, as well as some inorganic materials like vermiculite and perlite. Pumice is a solidified frothy magma. It contains a large percentage of cavities on the surface and holds an adequate amount of water and nutrients. It has a relatively soft texture and roots ramify well in it. Scoria (lava rock) forms from basaltic magmas, while pumice forms from rhyolitic magmas. Scoria has many similar properties with pumice and can generally be used as a replacement except a few disadvantages. Its particles often have sharp edges which can wound the roots when a container is squeezed. The larger cavities on the particle surface can prohibit root elongation if a root tip is trapped in. For a young seedling with a few roots, this can result in growth stunt. Calcined clay and calcined diatomaceous earth are substances that have the physical state changed after being heated to a high temperature. They are highly water absorbent and are mixed with other components to increase water retention. Granite and sand are heavy in weight. They retain little water and are used for reducing water retention of a mixture. A good growing medium approaches dryness in ~1 week under local average weather conditions. 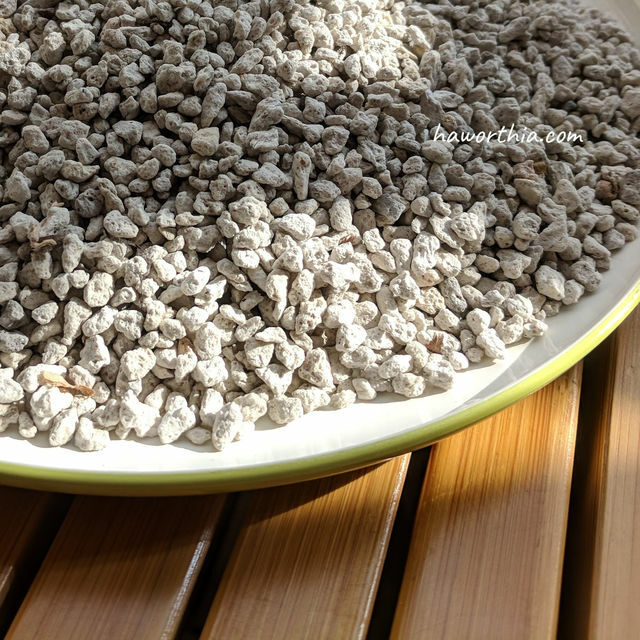 Starting with 100% pumice, mix with calcined clay or calcined diatomaceous earth if the growing medium dries too quickly, or mix with granite or sand if the drying process is slow.